This exciting seaplane tour lets you admire the whole Seattle metropolitan area from a whole new perspective. 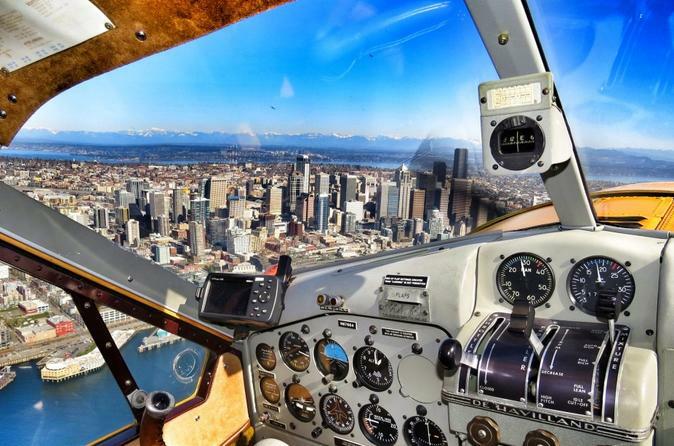 Soar over downtown Seattle, Puget Sound and Lake Washington on a scenic 20-minute flight offering breathtaking panoramas. See the Space Needle, spot the homes of Microsoft’s Bill Gates and Paul Allen, view the awesome houseboats on Lake Union and more, all with the stunning Olympic Mountains and Mt Rainier as your backdrop. Our seaplane flight departs from the city of Renton, located 11 miles (18 km) southeast of downtown Seattle. When you arrive at the seaplane base, hop aboard your 6-person seaplane for an exhilarating 20-minute flight over Seattle. As you fly over Lake Washington, your pilot will point out the homes of Bill Gates and Paul Allen, the co-founders of Microsoft. Approaching Seattle proper, admire views of the skyline punctuated by the iconic Space Needle. From above, this is a quite a sight to see! Spot Mariner’s Safeco Stadium, the Seahawks' CenturyLink Field and the University of Washington’s Husky Stadium. Admire the houseboats on Lake Union and see and learn about the Ballard Locks (formally Hiram M Chittenden Locks), a complex of locks at the west end of Salmon Bay on the lake’s Ship Canal. You'll then soar over lovely Puget Sound. The backdrop to this incredibly scenic experience is the Olympic Mountains and Mt Rainier, towering at 14,410 feet (4,392 meters) above sea level. Be sure to bring your camera for the amazing views! Your 20-minute Seattle seaplane flight lands back in Renton.